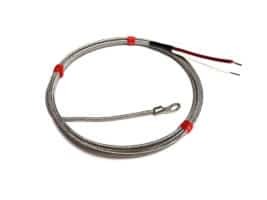 Allied Instrument offers Thermocouples and RTD sensors from Apollo Sensors. Apollo sensors are made with the highest quality components for outstanding reliability. Please contact us today for assistance. 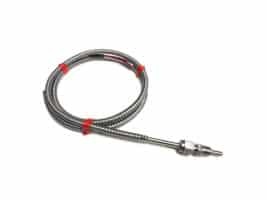 Easily obtaining a desired probe depth, the adjustable bayonet sensor uses a spring or armor hose to create a spring loaded effect. the bayonet cap rotates up and down a 10″ spring or the full length of the armor hose. 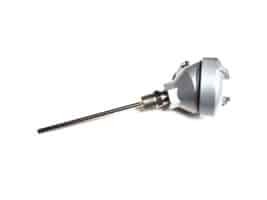 This allows for a tight positive contact between the probe tip and the surface for accurate temperature readings. 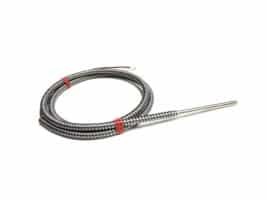 Fixed probe thermocouples can be used in drill holes where mounting is not an issue. This type of construction can be submerged in liquids. moisture proofing the lead exit is a popular option for immersion applications. Fixed bayonet sensors provide constant spring pressure in the well. 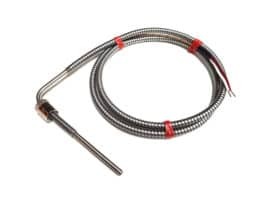 This style of thermocouple can be provided with a connector at the back of the probe to eliminate the lead wires. A critical dimension for this style probe is the mounting length, which is from the tip of the probe to the back of the cap. The standard length is one and one quarter inch. Another option for installing a thermocouple probe is with the use of a compression fitting. After drilling and tapping a hole, the compression fitting can be installed in the application and tightened onto the probe securing it in place. A brass 1/8″ NPT is standard while others are available. 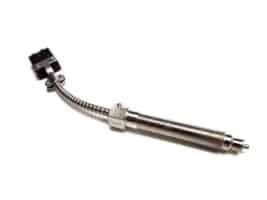 Protection head assemblies are typically used in conjunction with a thermowell. 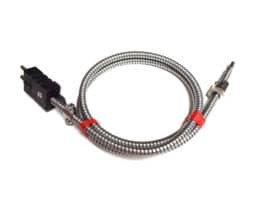 The sensor can be mounted directly into the process or can be mounted into a thermowell, which is then mounted into the process. The pad mount style sensor is a great way to measure surface temperature. 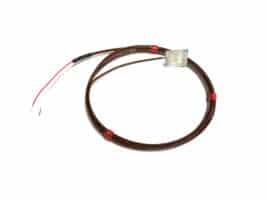 The low profile allows for pad to be placed between components for sensing temperature. This is an option for measuring nozzle heat on a molding machine. The pads can be made rigid or flexible and in different sizes to meet your needs.